An intrepid performance, great production value, good direction, witty writing. 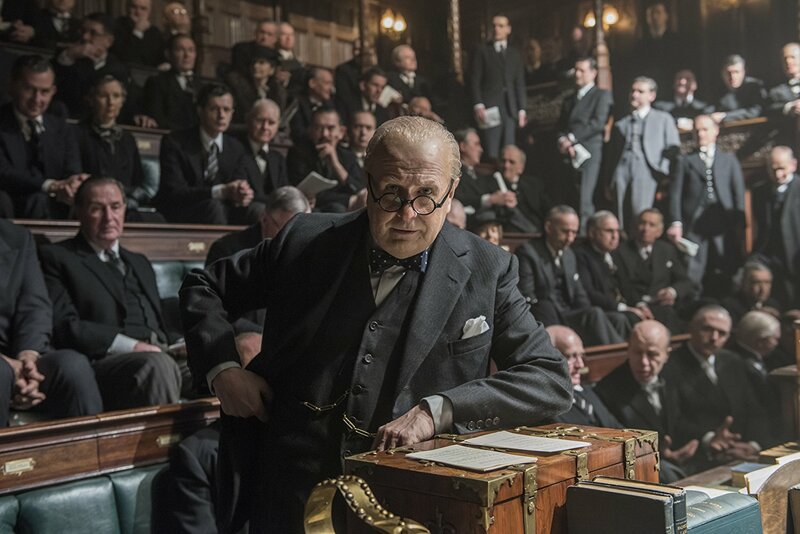 Darkest Hour carefully checks off the most important characteristics necessary to earn a few award nominations, but it doesn’t have the conviction or the depth of a Winston Churchill speech to convince us of its imminent victory. The film belabors and boils big issues down to the point that they feel small, and while it revolves around one gigantic role inhabiting another soul, the story instructs us through histrionic details instead of the seriously lacking personal insight. Darkest Hour is important history that’s been written – and admittedly correctly voiced – in chicken scratch shorthand. Such a rich picture should have a few more tricks up its sleeves. Winston Churchill (Gary Oldman) became Britain’s Prime Minister by process of elimination; the compelling conservative candidate cowered with the fear of imminent defeat and Winston was the only man capable of appeasing both sides. He was controversial to say the least, but despite the missteps of his past, Churchill desperately wanted the job, intent on proving himself and saving Britain from Nazi invasion. This essentially is the entire nutshell of the film. That doesn’t mean it isn’t entertaining or doesn’t provide important historical context, but it’s handled so safely that the outer casing never cracks open to give us something to chew on. For a story primarily about one man’s enormous choices, the motivations behind Churchill’s decisions are far too thin. Granted, the film does execute some fine creative decisions, such as the running on-screen calendar and cinematographer Bruno Delbonnel’s sparsely lit frames, abiding by the self-descriptive restraints of the title itself. 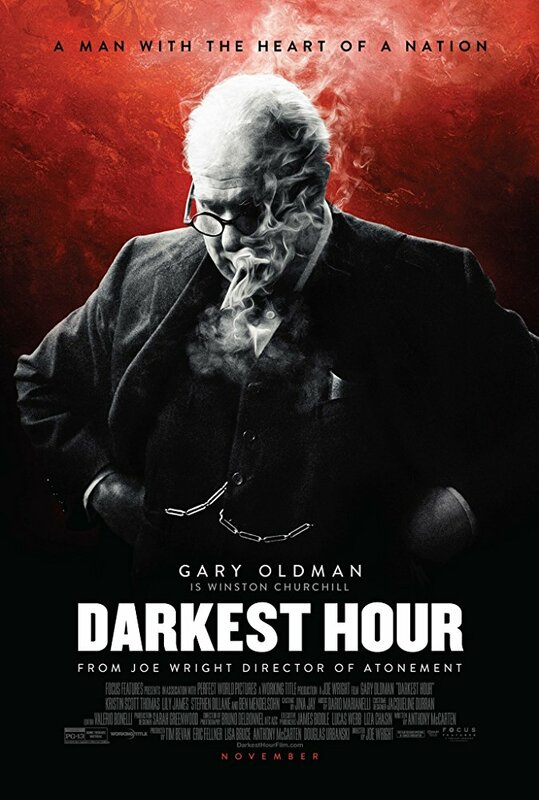 Darkest Hour is, quite literally, a very dark two hour watch, featuring performers mostly illuminated by the lights of a carefully crafted overhead half moon. And as for Joe Wright’s direction, you can sense and occasionally see his attention to detail, hanging his hat on a scene and lingering in the moment when necessary, as well as slowing down or speeding up the narrative to fit the nature of what’s occurring in the film. Wright has done the best he can with a script that’s extremely one-note. Darkest Hour uses movement to enliven a screenplay that’s pretty much a feature length monologue. Sure, it’s engrossing and at times even stirring, but the fact that the only line I remember – “don’t interrupt me while I’m interrupting you!” – feels so ridiculously corny and hardly inspiring. I’m left wondering whether or not this film had the correct tone. Playfulness does not mix very well with dead-eyed solemnity. 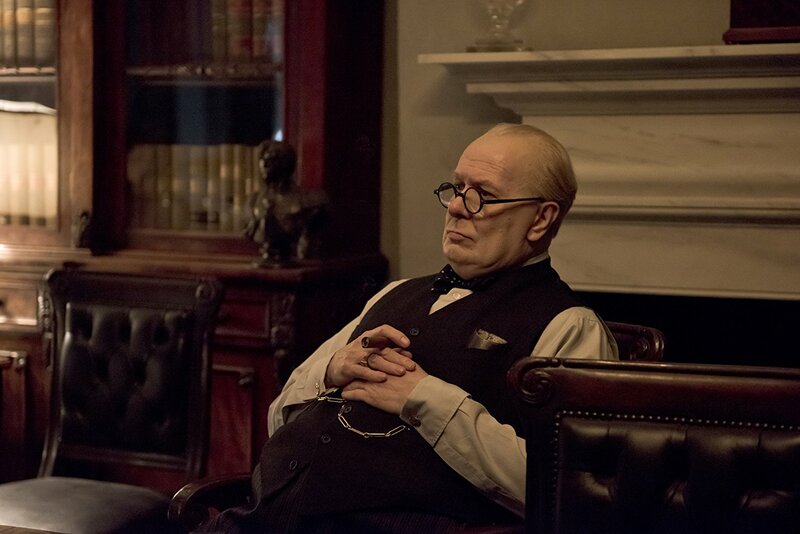 While I wholeheartedly recommend Darkest Hour – mostly, if not entirely, for its timely portrait of one man’s ceaseless opposition to the throes of tyranny and Goldman’s steady presence in an all but decided Oscar winning role – I was still incredibly frustrated by its character development. 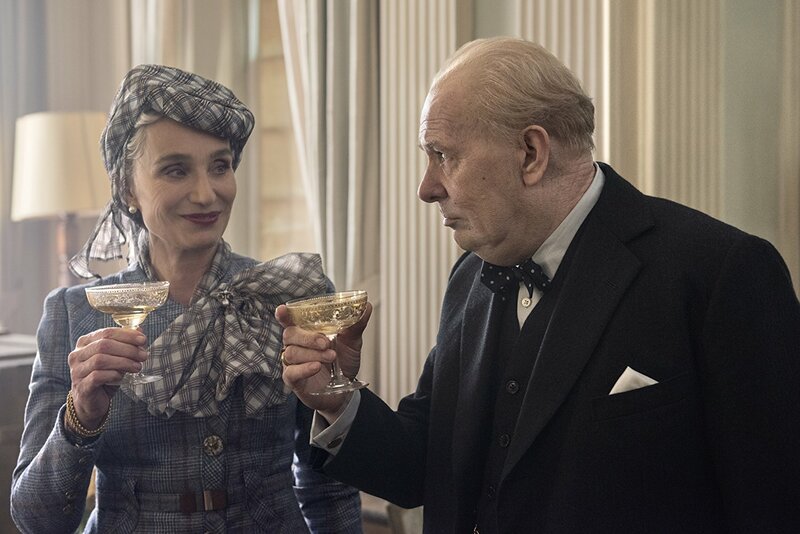 Churchill’s spouse Clemmie (Kristin Scott Thomas) is anecdotal at best, and his typist Elizabeth Layton (Lily James), clearly included to humanize this intellectual and cigar smoking drunkard, has no agency in this/her own story. I’d have preferred if the film had forgotten the accoutrements, trimmed itself down a bit, and delivered the sort of meat and potatoes main course that audiences deserve to weigh on their bellies long after seeing a story of this magnitude. Darkest Hour might look like a relic worth worshiping, especially given its connection to the idiocy of modern politics, but it’s more or less a one-man show better suited for the intimacy of the stage instead of the vast scope of big screen.